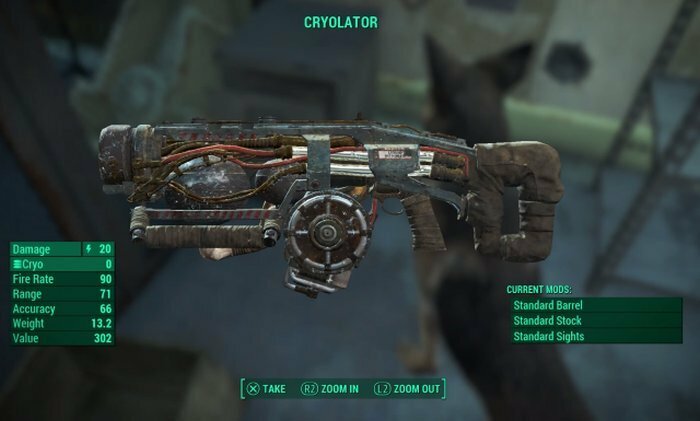 The Cryolator is the first amazing weapon that you get to see in Fallout 4, as you prepare to leave the Vault 111. The only problem is that you can’t get access to it as it is behind a Master Lock, but you promise yourself, with your in-game voice, that you’ll be back for it. And even though you’re not Arnold Schwarzenegger, you do keep these promises! One way to get the Cryolator in Fallout 4 is to wait until you level up and unlock the perk that allows you to pick Master Locks. But why wait so long when you can have it as soon as you start the game, without cheating? It might be a glitch or a bug, but it’s one that’s certainly worth trying out! In order to get the Cryolator weapon in the game, simply get Dogmeat as your companion and head together with him back into vault 111, in the Overseer’s room, where the weapon is located. Get close to the case holding the weapon and interact with the dog. Talk to him, then command him to “Fetch”, the “Items” and he will start barking at the container. The gun will appear in his mouth and you can get it. Check out his inventory as well, because he will also have 200 rounds of ammunition for the Cryolator, which is absolutely amazing! After getting the Cryolator easily, make sure that you don’t waste the ammo! I would personally suggest to only use it against legendary enemies or the ones that are difficult to beat (have a red skull next to their name) and only use it in VATS to conserve ammo and increase your chances of hitting. This is an amazing weapon and you should put it to good use! And now you know how!